Explore the newest chapter in The Elder Scrolls Online with detailed maps, quest guides, and expert combat tactics to the Summerset Isles. This 320-page hardcover Collector's Edition guide includes a map poster, art gallery, detailed world atlas, quest walkthroughs, skill tree recommendations, and complete coverage of new modes, boss strategies, and enemy tactics! 27" x 27" (685.8 x 685.8 mm) Map Poster: A large, full-colour map of the Summerset Isles, thoroughly labelled with all the important locations, locales and resources. Art Gallery: Striking images of the new expansion. Foreword from the Developer: A message to fans. 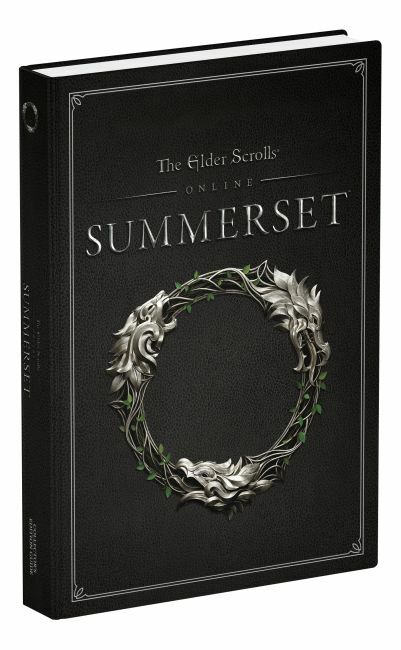 An Atlas of Summerset: Every major point of interest is called out and catalogued for your reference. Use our detailed print maps and our digital interactive maps to expertly navigate the isles! Character Builds: Hints and advice on choosing skills and constructing effective characters for your adventures. Crafting and Armour: Customise your appearance and stats with crafting guides and details on new armour sets. New Stories and Quests: Maps with walkthroughs that pinpoint and describe how to complete all of the new quests and storylines contained in this expansion. PLUS: Complete coverage of Delves, Dungeons, Trials, and more!